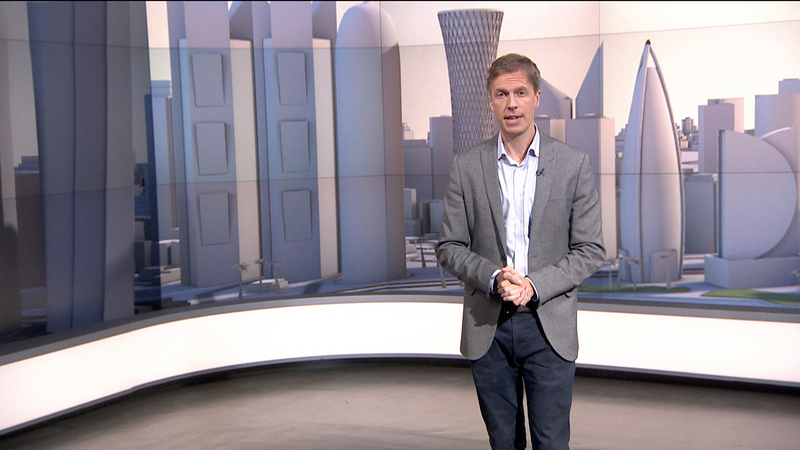 During the Gulf Cooperation Council crisis in July, Al Jazeera English needed to create an effective way to explain the story to its viewers — so they turned to augmented reality to assist in the storytelling. In order to help explain the effect the crisis had on the daily life for citizens, residents and businesses, the network needed to explain a wide range of information, namely updated flight paths and import and export transport routes. 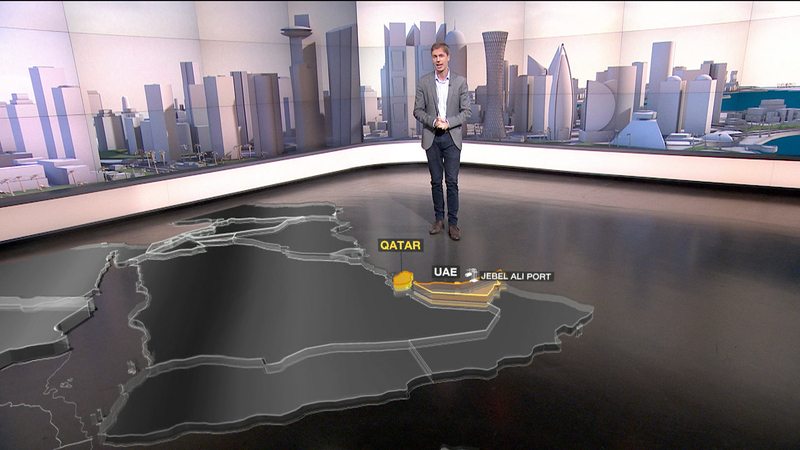 Naturally, the network turned to maps to illustrate this type of information — and opted to “place” that map on the floor of its multi-purpose studio in Doha, which was part of the network’s recent upgrade. By producing the segments in an area of the studio that includes a dog-legged video wall, the network’s design team recognized the panels would be a natural place to showcase a virtual view of Doha’s seaside coastline. Rather than attempt to recreate the buildings in detailed 3D in Vizrt, however, the network opted to use simplified, blocky shapes that not only created a clean and modern look but also helped draw the eye to the map details. The maps, meanwhile, were rendered as glassy slabs that appeared to be sitting on the floor, a strategic way to leverage transparency to blur the lines between reality and virtual. Bright gold, red and a pale orange shade were used to spotlight countries, routes and other elements on the virtual maps, as well as other 3D elements.